Proper font usage is another important consideration when building a logo. There is no right or wrong font for any particular logo. There is no logo god that will come down from the heavens and smite you if you choose the wrong font. But there are some considerations to take into account. Typically, script fonts are used to convey elegance or sophistication. They are often very detailed and attractive, and provide a sense of upper-class, femininity or charm. The very thing that makes script fonts attractive for use in logos is usually the biggest reason to avoid them, that reason being the intricate and fine line detail. The problem with script fonts in logos is that the fine lines and details have a tendency to disappear when the logo is reproduced at smaller sizes. The other issue is that even at larger sizes (signage and display materials for example) the fonts typically won’t have enough thickness to be easily read from a distance. The connected nature of the individual characters and many looping ascenders and decenders reduce the legibility of the word. If your logo calls for a script font, choose carefully or modify the font so as to make it easier to read. Thicken the paths, add a stroke or use the bold font style if available. Never do a script font in all caps (this applies to everything, not just logos). It is an ugly effect and very difficult for the human eye to read – especially when you have but a moment to capture the reader’s attention. If it looks jumbled or messy, the reader will just move on to something more appealing. Serif fonts offer a more versatility than script fonts. They can be elegant or reserved, playful or professional. I prefer serif fonts for logos for their versatility. As mentioned earlier, studies have shown that serif fonts are the easiest for the human eye to distinguish, and when space or legibility are premiums, you want a font that makes it easier to be seen. There aren’t many reasons not to use a serif font. You still have to be very mindful of reproduction issues. Some serif fonts have very fine lines, particularly in the “feet”. At smaller sizes, the serifs may disappear or blur into other characters, which reduces legibility. Planning is the key here to avoid any reproduction problems. Shrink the font, blow it up, and look at it from across the room to check that it is still legible from varying distances. I typically design most of my logos to be effective down to 1 inch in size (width or height, depending upon the logo). There may be situations that call for smaller than 1 inch, but for most applications like print advertising, letterhead, business cards and promotional products, the 1 inch size is a good rule to follow. Sans Serif fonts are often a safe bet for logos. They are usually crisp, clean and offer straight even lines. Fonts like Helvetica, Impact, Gill Sans and Frutiger will generally reproduce well at all sizes. Sans Serif fonts can lend themselves to a wide array of uses ranging from industrial to high-fashion. They can be very bold and commanding, or very thin and elegant. The thing about sans serif fonts is that they are not often as visually expressive as serif or script fonts. At first glance, sans serif fonts may be dismissed as being too plain or uninspiring. With sans serif fonts, you have to cheat a bit to get them to show their inner character. An easy way would be to kern/track them out and increase the spacing between the letters. You can also play with case. Capitalize everything but leave only a particular letter as lowercase. Decrease or increase the horizontal scaling to make the font thinner or wider than it was intended to be. Just make sure that it isn’t too bold or too thin so to ensure that the ink doesn’t bleed together and create a huge blob instead of text, or so thin that enough ink doesn’t stick to the page. Beyond deciding whether a script, serif or sans serif font is the right style of font for your logo, another consideration is the actual font you select. There are fonts that are extremely overused. Fonts like Zapf Chancery, Brush Script, Comic Sans, University and Lucida Calligraphy usually come standard on most computers and/or are installed with common programs like Microsoft Word. Everybody has access to them and they tend to find their way into an excessive array of projects — especially logos. The result is overuse. Be original. Be unique. Make your choice of font one of logic and design, not of convenience. 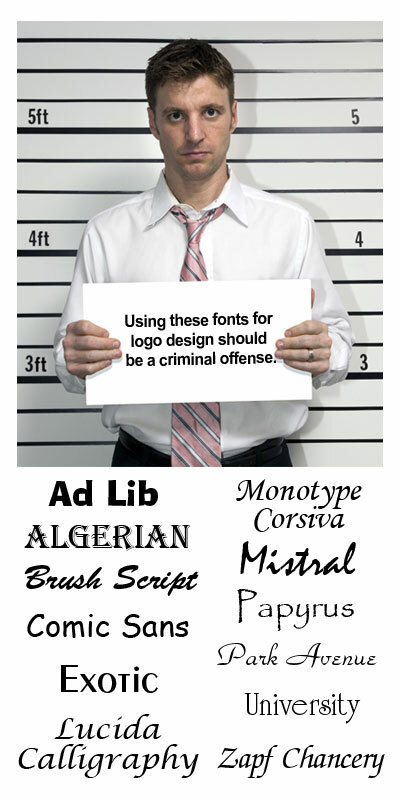 To sum everything up, fonts can have a substantial impact on the effectiveness of your logo design. 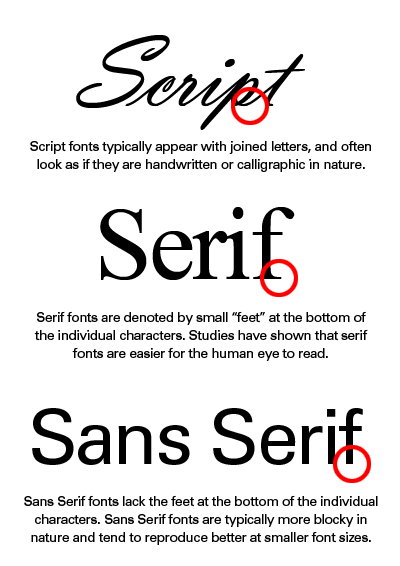 There is no font that is 100% suitable for any situation (though it’s a good idea to avoid the fonts shown above to maintain a distinctive logo). Any font can help set the tone and convey a desired message or theme. It is important to be selective and choose carefully; customize the font when needed and design for impact and reproduction.